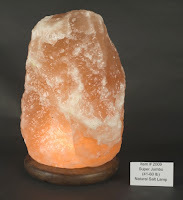 Himalayan Salt Lamps from Songbird Prairie Boutique emit a soft, therapeutic glow while naturally purifying the air. These lamps naturally reduce dust and allergens from the air, and provide a natural-feeling light source that is beautiful in the daytime, and works well as a nightlight. Himalayan Salt Crystals- A large inland sea, buried by mountains and slowly dehydrated thousands of years ago, is the source for pure Himalayan Salt. The salt mines are believed to have been discovered by Alexander the Great in 326 AD in what is now northeast Pakistan. Himalayan salt crystals contain high amounts of trace minerals, and emit energizing negative ions when warmed. These are the same ions found in naturally rejuvenating sources like beaches, mountains, and waterfalls. They have an energizing effect and can improve mood. Negative ions can also help counteract the positive ions emitted from devices such as phones and computers, neutralizing them and freshening the air. Positive ions in the air can be carried by water molecules. Salt is hygroscopic, which means it naturally attracts water molecules from the air. As salt crystals are warmed by the bulb, the collected water molecules evaporate, helping to neutralize the positive ions trapped in them. The warming bulb illuminates the crystals to create a soothing, therapeutic glow.